Less than a decade ago, human egg freezing was considered a new, expensive and uncertain technology. Today, the costs will still put a dent in your bank account, but science has made great advances. The breakthrough was a process called vitrification or flash-freezing. “ 80 percent or more of vitrified eggs survive thawing and up to 12% of thawed fertilized eggs produce a pregnancy.” With significant improvements in freezing and thawing techniques, the probability for overall success increases. According to the Center for Disease Control and Prevention, today one in five US women have their first child after the age of 35. With many women postponing motherhood to focus on personal and professional opportunities, age-related infertility is high on the list of reasons why women consider egg freezing. 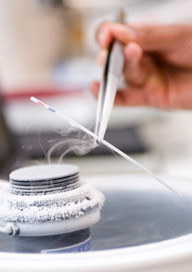 Although egg freezing can be successful in treating infertility, the guidelines issued by ASRM suggest proceeding with caution. “Women who are considering doing this for elective reasons should understand that they are really at the leading edge of using this technology and we’re not yet certain that it will provide the promise that we hope it does. But at this point, we think the available data is strong enough to say it’s reasonable to do,” says chairman of the Society for Assisted Reproductive Technology Practice Committee, Dr. Eric Widra. Removing the "experimental" label urges insurers to cover egg freezing for cancer patients hoping to preserve their fertility, boosts the banking of donated eggs and encourages fertility clinics to publicly report their success rates. The more accessible the egg freezing data and information, the easier it is for a woman to make an informed decision about whether the option is right for her. Lifting the “experimental” label is very exciting news! To take a look at the report from ASRM, click here. That's great news, Jenni! Is it going to make it possible for insurance to start covering this immediately, or will that process take some time? It will take some time, but it's a step in the right direction!